Most of you know that one of my areas of clinical expertise and interest is pediatrics and pediatric developmental disabilities. It is very difficult to provide nutritional care services to a child without extending support to the parents and families as a whole. While I am honored and humbled to be considered a part of your village and guide you in your nutritional care I have longed for the day when I would see the flood of chronic nutritionally related illness quell. However the tide does not seem to be turning. It has only worsened in these past 30 years of my clinical practice. I have a passion towards prevention when at all possible. Always trying to mitigate the damages of our current lifestyle and poor food choices in an effort to support the body. Nutrition is foundational for healing and wellness and while all of us seem to be aware of prenatal nutritional needs no one gives much thought to preconception readiness. As I watch the numbers of young people coming to me for dietary and functional nutritional advice grow in their lists of diagnosis and medications and compromised intakes I have often thought wow how can I get them truly healthy and well so that some day they can support gestation and have offspring who will be healthier than they? I know the seriousness of this statement compounds the profoundness of this thought as most will likely not conceive their first child until well into their 30's when their total body burden will be even greater. That is where SOMAVANCE my new supplement line comes in. 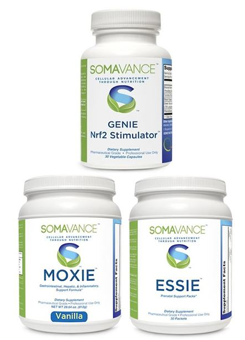 SOMAVANCE cellular advancement through nutrition is my way of feeling like I can do all I can to make ready new parents' bodies to support optimal health and wellness when they are ready to start a family. The news and journals are filled with articles related to ways our current environmental conditions and food supply are increasing our body burden and promoting inflammatory diseases. We have grown so accustomed to it and think that allergies digestive problems chronic infections focusing and attentional issues are the new normal and that medications for symptom relief is a way of life. Prevention of this cascade is possible through improved nutritional support. It is time to make a difference to the best of our ability and with the knowledge we have to make ready our bodies for future generations. Please take a look at the website and look forward to more offerings including informative group meetings and webinars. This is a vital campaign that I feel so strongly about. I know how important it is to leave this world a bit of better place because I was here and how important it is to influence for the better the health and well being of generations to come. Optimal nutritional status is key. It influences our very survival as a species. Always a pleasure when you love what you do!